When you open the Start menu, it provides a menu item to display a list of all the files that you have recently opened. 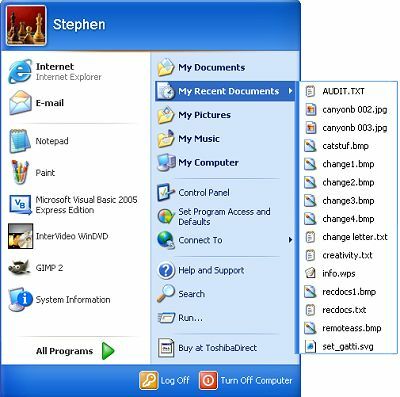 Although this can be handy if you want to work on those files again, it can also allow others who use your computer to trace your activities. 1. Right-click on the Start button and, in the popup menu that appears, select "Properties". 2. 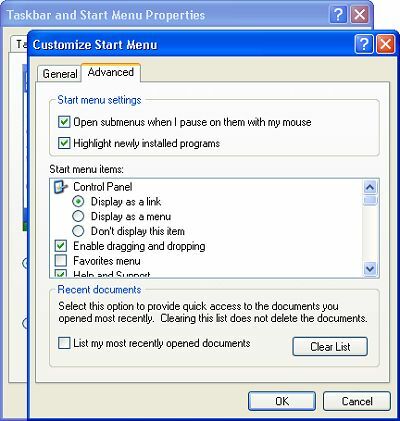 In the "taskbar and Start Menu Properties" dialog box that appears, select the "Start Menu" tab. On the "Start Menu" tab, the "Start Menu" radio button should be set. 3. On the "Start Menu" tab, click on the [Customize...] button. 4. In the "Customize Start Menu" dialog box that appears, select the "Advanced" tab. 5. On the "Advanced" tab, at the bottom of the dialog box, uncheck the checkbox next to "List my most recently opened documents. 6. Click on the [OK] button in both boxes to close them.